If you do not have a specific theme in mind, perhaps you could start with the event itself. Kid’s birthday parties generally speaks of fun, bright colours and super cool flavors. As for bridal showers, gourmet desserts with an elegant color palette would be great. Most of the time, the venue, the dress code and the invitations will have inspiring design elements. The quickest way to create an impression for a dessert table is with color. Everything you place on the table should match your theme or colour scheme. It is suggested to choose between 2 or 3 monochromatic colours. If the colour palette is pastel, do ensure the cupcakes and other sweet treats are almost the same tone! One of the simplest and foolproof layouts is to place all the smaller treats at the front and the larger pieces to be placed on stands at the back of the dessert table. If there happens to be a cake, place in as the centerpiece. Insert some floral arrangements or other filler items to enhance an aesthetic look. Use handwritten signs, calligraphy, chalkboard signs, and matching stationery to label and describe your delectable desserts. Pick jars, bowls, plates, containers, platters, canisters and stands in different sizes and shapes. Clear glass containers are perfect for displaying colourful candies. Having one or two sugary treats on the table with great details would make your dessert table stand out. However, don’t go too over the top for every element on the table. 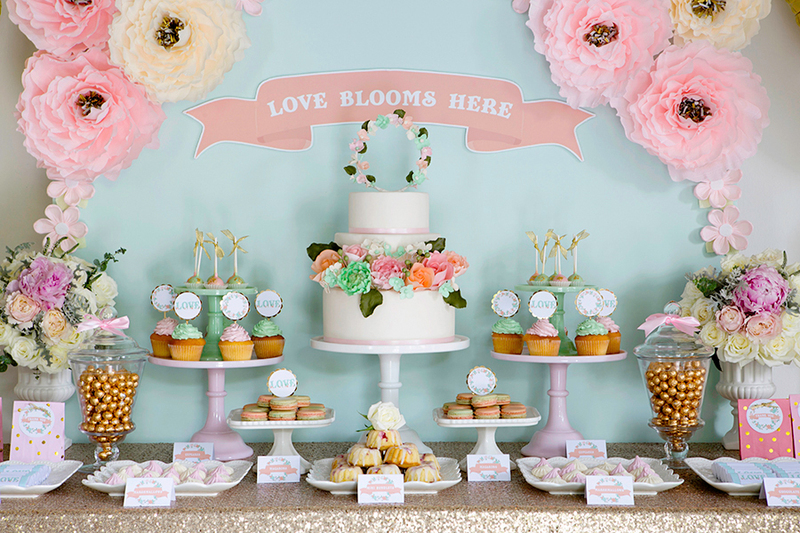 Having a dessert table with every single sweet heavily decorated will look too cramped up. Balance out a sophisticated cake with jelly beans, mini cupcakes, cookies, chocolates, and hard candies.